This shop has been compensated by Collective Bias, Inc. and its advertiser. All opinions are mine alone. #Mach3Signature #CollectiveBias Who else HATES having beard hair in the sink? Anyone? Anyone? Don’t get me wrong, I LOVE that my husband has a gorgeous beard, but who knew that man-scaping one’s face could be so messy?! Before we shared a bathroom, I had no idea that beautiful, tailored, manly facial hair was groomed to look that way. I guess I assumed that some guys were just “blessed” with good facial hair. Not so ladies, not so. It’s actually a very artistic process that my husband Nick takes very seriously. To keep his beard looking smooth, he starts by trimming all of the hair with clippers, and then finishes by getting a smooth line on his cheeks with the newly introduced (and affordable) Gillette® Mach3® Signature Edition Razor. Imagine if it lightly snowed on your bathroom countertops and sink, but instead of snow, it was hair trimmings (still, totally worth it). So in case you didn’t already know what to expect, you’re welcome! I recently saw an advertisement for a “beard bib” on YouTube that suction cups to the mirror, catches all of the beard trimmings, and makes clean up smooth sailing as you can dump the trimmings right into a waste basket. Genius right!? 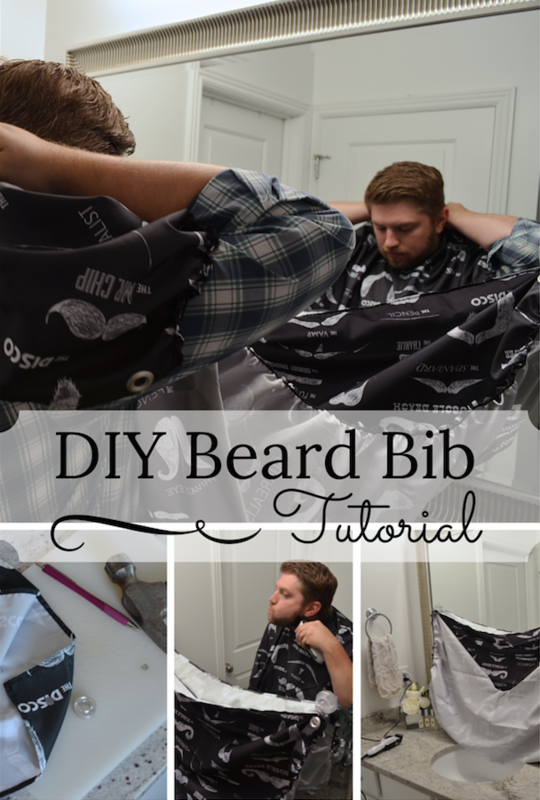 I’m crafty, and I love a good DIY, so here is my version of making your very own (bathroom counter saving) beard bib. Start by marking the four outermost corners of the cape by tracing the eyelet with a pen. Go in about an inch from both sides of the corner. This is the hole that the eyelets will go through and give your beard bib a professional look. Carefully cut the small marked hole; it needs to fit perfectly to avoid fraying after you add the eyelets. Place in the bottom of the eyelet, and then the top piece. Remember, the eyelet piece with a “neck” should be on the print side; that way when you hammer it together, it won’t have a little folded seam. Secure with the eyelet tools. Hammer the eyelet until the sides are pinched together tightly. Trace and repeat on all for corners. Using a single stitch sewing machine, add elastic to the longest sides of the bib (the front would be where the bib would hang on the mirror and the back would be where it buttons around your neck). This will help to prevent hair from falling out along the sides while the bib is in use. Sew the elastic right along the cape’s hem; this will give you a guide to follow while you sew it on. Make sure to stretch the elastic out as you’re sewing so it gathers up on the sides. It should gather easily as soon as it’s sewn on. After repeating to the other side, you are ready to get your mess-free shave on and make cleaning up smooth sailing. To use the DIY beard bib, add two suction cups with attached hooks to the mirror. Button up around your neck and start trimming. Simply remove the bib and (using the eyelets on the back of the cape) hang the bib so its contents stay safely inside until you are ready to come back and finish. Once you’ve finished you’re trimming, unhook both sides and carefully dispose of the hair. This may require a few good shakes to get all of the hair out of the bib. Afterwards, fold up the bib and finish the look with a smooth shave that’s up to 100% redness-free. (It’s possible with Mach3®.) To get a smooth shave, my husband uses a little bit of shave oil, water, and the Gillette® Mach3® Signature Edition Razor (I found it at Costco). Normally his skin breaks out right after a shave, but this razor (thanks to the DuraComfort™ Blades, Responsive Blade Suspension, and an extra-lubricating gel strip (vs. Mach3®), he didn’t! I would recommend it for anyone who struggles with sensitive skin. So make sure to grab a Gillette® Mach3® Signature Edition for your man the next time you’re running errands at Costco. Want to hear something funny? My husband once compared shopping to dying slowly, so he doesn’t go to Costco or any store for that matter. Basically that leaves me as his personal shopper, pretty sweet set-up right? I mean, I would love a personal shopper! Because I’m a smart woman, it only makes sense to buy in bulk so I don’t have to buy them as frequently. This improved razor comes with 14 cartridges and a handle at Costco, so you’ll have plenty of refills, at $36.99; it’s the right price (you can also find this deal online with free shipping). What are your best tips and tricks for helping keep your man’s face smooth and groomed? I am on the final step of creating an exact replica of the DIY Beard Bib you blogged about. It looks fantastic thank you so much for creating and posting it (my husband is going to love it!). I just need to get the elastic sew in and was wondering if you could suggest/recommend a brand and how much elastic to use on each side? Thank you so much for reaching out! It’s hard to say the exact length needed, I’d say 1/8 less than the length of the side being sewn (since you’ll stretch it). Another option is to pull it while you sew it on, and trim off the unused amount at the end. Any brand of elastic will work, just as long as its 1/4 inch thick.